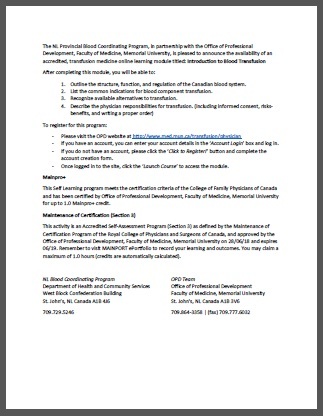 The NL Provincial Blood Coordinating Program, in partnership with the Office of Professional Development, Faculty of Medicine, Memorial University, is pleased to announce the availability of an accredited, transfusion medicine online learning module titled: Introduction to Blood Transfusion. Outline the structure, function, and regulation of the Canadian blood system. List the common indications for blood component transfusion. Recognize available alternatives to transfusion. - If you have an account, you can enter your account details in the ‘Account Login’ box and log in. - If you do not have an account, please click the ‘Click to Register!’ button and complete the account creation form. - Once logged in to the site, click the ‘Launch Course’ to access the module.